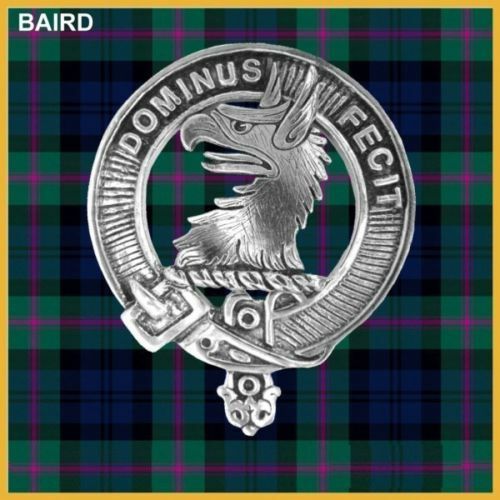 The coat of arms of the Baird family proclaims the legend of its origin which, like so many, involves a feat of strength which saves the life of a king. This version states that the first Baird saved William the Lion by killing a wild boar. The name appears to be territorial, from lands held by the family in Lanarkshire near the village of Biggar. Henry Debard witnessed a deed by Thomas De Hay between 1202 an 1228. Richard Baird received land at Meikle and Little Kyp in Lanarkshire, during the reign of Alexander III. Anderson states that Fergus Debard, John Bard and Robert Bard, who swore submission to Edward I of England at the end of the thirteenth century, are sup­posed to be of the family of Baird of Kyp. Early in the following century King Robert Bruce bestowed the barony of Cambusnethan on Robert Baird, and from there the family spread first to Banffshire, and then to Auchmeddan in Aberdeenshire. From Auchmeddan branch of Newbyth gave birth to John Baird. Before his death in 1698 he had become a judge of the post-revolution regime, with the courtesy title of Lord Newbyth, and a baronet. Sir David Baird, who succeeded his second cousin in the baronetcy of Newbyth, was one of the leading generals of his time and saw action in India and throughout the Napoleonic Wars. His splendid house of Newbyth in East Lothian still stands. The estate of Auchmedden passed into the hands of the Earls of Aberdeen and, according to local tradition, a pair of eagles which had reg­ularly nested on the nearby crags left the area, fulfilling an ancient prophecy by Thomas the Rhymer, that “there shall be an eagle in the craig while there is a Baird in Auchmedden”. Lord Haddow, eldest son of the Earl of Aberdeen, married a younger daughter of William Baird of Newbyth, and the eagles returned. They reputedly fled again when the estate passed to another branch of the Gordon family. But the world renown of this name was bestowed on it by John Logie Baird (1888-1946), whose ancestry is uncertain. He was born at Helensburgh in Dunbartonshire, son of the Rev. John Baird, and educated at Glasgow University. In 1926 he gave the world’s first demonstration of television in an attic. The first trans-Atlantic transmission of television took place in 1928. From first to last, Baird was the pioneer of every development associated with television, and few men have done more to alter the habits of the human race throughout the world.